Calling all BCTA members and sports fans alike! October 6-14 we have an amazing opportunity to see professional tennis in our own backyard! 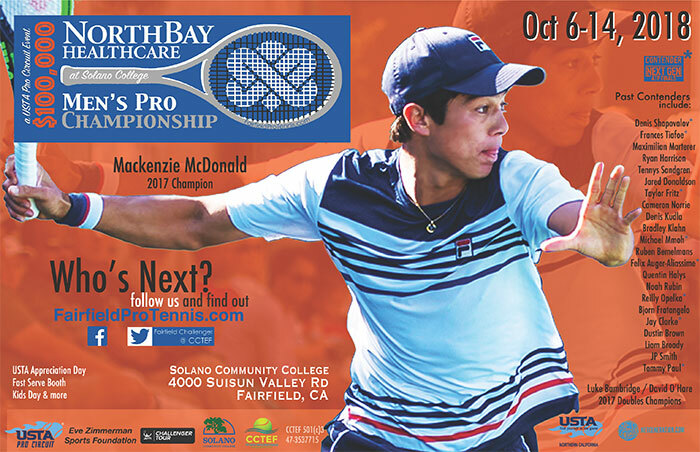 Solano Community College is hosting the North Bay Healthcare Men’s Pro Challenger on their campus. They need sponsors, volunteers, ball kids (and adults! ), help with promotions, ticket sales and more! Take part in this exciting, community-supported event. Tickets for evening sessions under the lights can be purchased now. The opening qualifying tournament Oct. 6-7 is FREE, along with the morning and day sessions Monday, Oct. 8 through Friday, Oct. 12. Evening sessions Monday through Friday are just $5. Saturday, Oct. 13 and Sunday, Oct. 14 tickets $15. The final weekend features singles and doubles semifinal and final matches. Saturday also offers a wheelchair tennis exhibition with Sunday featuring an exhibition of Junior Team Tennis. All seats are courtside. Which tennis pros play in this tournament? Any top player from around the world can compete in ATP Challengers to gain points necessary for improving their rankings and stake their claim on the $100,000 prize money (total purse). This is the highest level ATP Challenger event and one of only six tournaments like it in the U.S. Proceeds from this tournament will benefit the Chris Cammisa Tennis and Education Fund, a non-profit organization which has been working tirelessly to reinstitute college teams at Solano College, as well as tennis and education programs for local students and adults who might have the desire to play, but not the financial means to join a racquet club. Help with promotions! Send this out to everyone you know. . .Captains, please forward this to your teams, talk about it at your clubs, on the court, with friends and family and people that want to get out to do something great close to home! You may not need them! Tickets are only required for the semi-finals and final match which will most likely take place on October 14 and 15. Those tickets start at $10 and will be available for PURCHASE ONLINE. The rest of the matches are free of charge! More information will be posted on the Benicia Community Tennis Association Facebook page, so stay tuned! A huge round of applause goes to BCTA members Rafael Rovira, tournament co-director and Senné Dolter, volunteer coordinator. Way to go Raf and Senné!